This small garden represents one of the most difficult situations on a slope. With very little space available for terracing, the design relies almost totally on cutting into the slope and hardly any filling. It would mean that nearly all the excavation would have to be taken away, and that a specification for the main retaining wall would need to be drawn up by a struc­tural engineer since it is so close to the house. A stepped retaining wall down one side protects the neighbouring land from the excavation. On the other side, a different arrangement means that a gap between the retaining wall and the fence will allow some planting on what is still a slope. The landing which juts out over the lower part of the garden, together with the front half of the upper paving, are the only areas to be made up with ‘fill’. The large landing formed by the part which juts out is an ideal place for tubs or pots of colourful flowers. If the general outlook in this direction was poor, a deep planting pocket in place of the three tubs would support a conifer or large evergreen shrub. The main part of the raised terrace could also have tubs of flowers or planting pockets. There is no grass in this garden so maintenance would be easy. 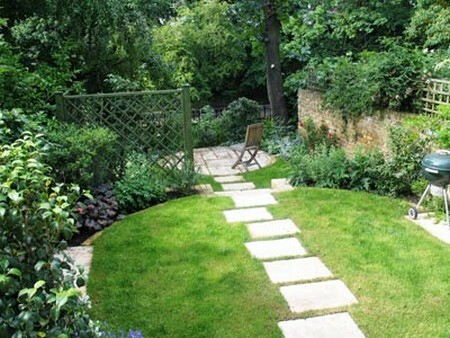 The lower level should have the same type of paving as the upper level, together with pots or tubs. Because the area has been cut from a slope, the borders may have to be dug out to make room for a reasonable depth of topsoil. For shrubs, this ought to be at least 400 mm (16 in). Planting in the sunny areas could be mainly herbaceous and annual flowers, but shrubs are more suitable for the shady borders. I have been reluctant to include any trees for fear that they would shade such a small garden. If, however, distant eyesores need screening, some trees or conifers might have to be included.